Excellent. I’ve taken delivery of my copy of Michael Wolff’s Fire and Fury. I previously had little intention of buying it, and couldn’t have until next week anyway, but Donald Trump’s attempts to block publication made purchasing the book more attractive and brought the launch date forward. This experience evokes a strong sense of nostalgia in me. In 1987, during the heady days of the height of Maggie Thatcher’s power, she was more inclined than ever to indulge in spasms of complete battiness. One concerned a rather bad book, Spycatcher by a certain Peter Wright, formerly of the spook service MI5. Maggie decided that the book represented a security threat to our fine kingdom. She seems not to have cottoned on to the obvious fact that anything the book contained would have been known by our then principal foes in Moscow, probably well before Wright had got around to writing it down. She set out to ban publication of the book. Since her writ never ran quite as far as she would have liked – which would have been worldwide (at least) – she was only able to block UK publication. The result was glorious: the book could be bought anywhere in the world, including in Moscow, but not in Britain. You might almost have wondered whether Thatcher was trying to prevent her own electorate reading about the ineptitude of some of our spies, rather than trying to protect secrets from the Soviet Union. I wasn’t particularly tempted to read the book, but I was damned if the iron lady was going to stop me. I persuaded a friend in the US to buy a copy and mail it to me, which he kindly did. As it happens, I didn’t read the blessed book for years and when I did, I found it turgid and unconvincing. I struggled to finish it. But at least, I’d made it my choice, and not Maggie’s, whether I read it or not. The point of this story is that Maggie’s fixation with banning the book turned an obscure third-rate work into a worldwide publishing sensation. 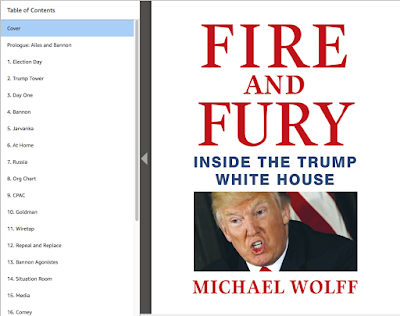 Just as Trump’s rantings against Fire and Fury have taken the book from 48,449th on Amazon’s list to the number 1 spot. By the way he has tried to block a book that claims he’s unfit for office, Trump has demonstrated just the kind of incompetence that makes the case against him. In fact, his reaction to the book condemns him far more powerfully than the book itself possibly could: it no longer matters if the book is entirely false, his reaction to it is authentic and visible to anyone. At least, to anyone with the eyes to see. Nearly three centuries ago, Voltaire spent three years exiled in England. Such was his talent, he not only learned English, he mastered it well enough to write a book in the language, a book that sparkles with humour and provocative insights. His Letters on the English would have made the King of France as apoplectic as Trump is over Wolff – only in the French case, most of his officials would have agreed. The English are the only people upon earth who have been able to prescribe limits to the power of kings by resisting them; and who, by a series of struggles, have at last established that wise Government where the Prince is all-powerful to do good, and, at the same time, is restrained from committing evil. Resisting Kings? Restraining their freedom to act? Oh, no, Louis XV would have taken a distinctly dim view. An Englishman, as one to whom liberty is natural, may go to heaven his own way. What? There might be a way to heaven that didn’t go through the one true Church? The clergy would have been as incensed as the King. No wonder Voltaire didn’t publish. Well, at first he didn’t. But it must have gnawed at him to have a book that good mouldering in a bottom drawer. He gave in to temptation. He published, though only in English. Still. Voltaire’s natural audience was his countrymen. Could he bear to deny them something that would enhance his reputation so forcefully? It seems, naughty boy, he’d prepared a translation and adaption which he called the Lettres Philosophiques. And he let a printer see them. And then another. And then, for good measure, a third. Under strict instructions not to publish. But they could see how well the book would sell. And when they discovered that others held the manuscript they began to fear that one of the other two would publish it first, creaming the most profitable part of a lucrative market. Eventually, the book appeared. Without the permission legally required, a permission the authorities would certainly not have granted anyway. And Voltaire was in trouble – worse trouble than Michael Wolff because eighteenth-century France had few restraints on the power of the authorities to make their displeasure painfully known. Trump might envy them their unbridled authority but he doesn’t have it. Voltaire’s friends got him away from Paris and into the deepest provinces. Eventually they persuaded the powers-that-were to leave him alone, on condition he stayed there, kept quiet and behaved himself. But something had to be punished, if only for the form of the thing. So the authorities seized a copy and condemned it to be shredded and burned on the steps of the Palace of Justice. A sentence that was carried out in all its brutality. Except that – actually, it wasn’t. The public executioner could spot a market opportunity as well as anyone else. In his hands was a first edition of the Lettres Philosophiques, a book that was selling (clandestinely) like hot cakes. He was going to burn it? Not a chance. He substituted some inoffensive and far less marketable text for shredding and burning. Keeping the Voltaire work as a nice little nest egg for later. Three centuries ago it was clear that obtuse autocrats trying to prohibit a provocative book would only make it more attractive and enhance its sales. Louis XV was an obtuse autocrat. Clearly, we have another such in the White House today. As Michael Wolff points out, “not only is he helping me sell books, but he’s helping me prove the point of the book”. I doubt Wolff’s book will be as good as Voltaire’s. But it belongs to the same fine tradition. It’s in that spirit that I’ve bought it. And I, rather than Trump, will decide whether I read it or not. This whole story is insane. And to think the guy who regularly spurts out the most outrageous lies is trying to suppress somebody's 1st amendment rights. Besides, there's no way in hell he could do it in any American court. In fact, it seems the cease and desist was probably more an action of staff members desperately trying to assuage the great big toddler, knowing full well it won't come to anything.